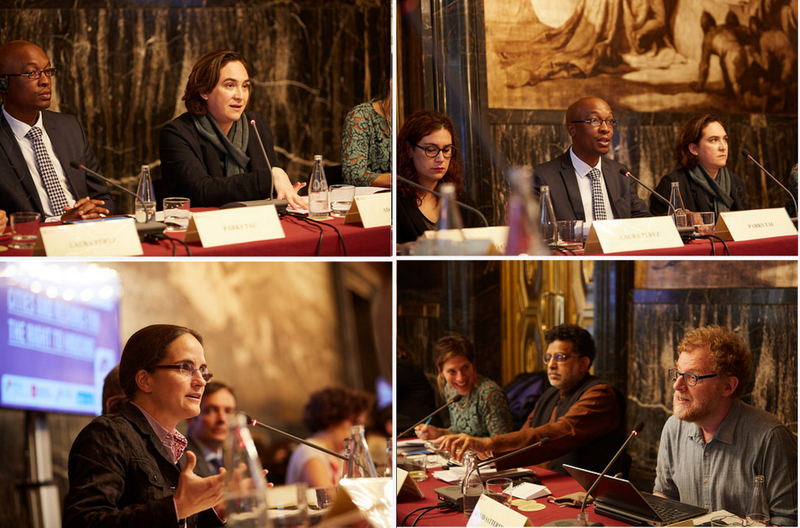 Local and regional leaders and housing policy experts met in Barcelona from 2-3 November to reaffirm their commitment to housing as a human right and share experiences on making it a reality. The meeting, “​​Cities for the Right to Housing”, was hosted by UCLG Co-President and Mayor of Barcelona, Ada Colau and the UCLG Committee on Social Inclusion, Participatory Democracy and Human Rights (CISDP). It was held in the framework of UCLG’s “wave of action” on housing for 2017-2018. On 2 November, housing policy experts met to assess current housing trends in each continent and share policy recommendations in the areas of multi-level governance, territorial inclusion and financing. Some of the key policy proposals discussed at the meeting included new thinking to close gap between housing costs and capacity to pay of people and engaging people through compelling local examples and city networking. The results of the expert meeting will serve as inputs to UCLG’s Fifth Global Report on Local Democracy and Decentralization (GOLD V) which will contribute to UCLG’s reporting on SDG 11 to the High Level Political Forum in July 2018. On 3 November, UCLG President, Parks Tau, Mayor of Barcelona, Ada Colau, UN Special Rapporteur on the Right to Housing, Leilani Farha, and Lorena Zarate of Habitat International Coalition participated in the public event “Cities for the Right to Housing” at Barcelona City Hall. Ada Colau highlighted Barcelona’s commitment to the right to housing as part of the right to the city, saying that housing was one of the main challenges faced by the city. Mayor Colau put particular emphasis on the international nature of the issue, pointing out that “investment funds are buying buildings and housing to speculate with in all global cities”. Parks Tau underlined that UCLG’s Bogotá Commitment includes the right to housing, and explained that the issue will be a priority for the organization for the 2017-2018 period. He argued that "to defend the right to housing we must also defend increased decentralization and local financing" because “too often, local goverments with the political will to achieve the #Right2Housing lack the tools to do so". For her part, Leilani Farha, explained the Make The Shift campaign, and the importance of challenging the commodification of housing, saying “housing has become a tool for profit, it's lost its meaning as home, a place to raise a family." The Rapporteur said that “local governments, thanks to their proximity to citizens, have a crucial role to play in realising the right to housing”. Lorena Zarate contributed the perspective of civil society, putting particular emphasis on the need to denounce the criminalization of homelessness. She called for “multi-stakeholder action” to guarantee decent housing for all. Finally, the Director of Urban Planning of Montevideo, Silvana Pissano, and the Vice President of Housing and Habitat of Plaine Commune, David Proult, expressed the enthusiasm of their cities to take the lead in driving forward the right to housing agenda within UCLG alongside Barcelona. The public event was followed by a policy roundtable at which David Satterthwaite of the IIED and the former UN Rapporteur on Adequate Housing, Miloon Kothari presented the results of the previous day’s expert meeting, and locally elected leaders discussed the roadmap for Make the Shift going forward. Finally, David Bravo from Barcelona City Hall presented the Barcelona Manifesto as a contribution to the debates within UCLG. The text, which is open to inputs from UCLG members, lays out ten proposed commitments for local governments in the area of housing, along with a number of concrete tools and policy instruments that can serve to combat evictions, gentrification and homelessness in cities. The manifesto also calls for decentralization of powers and competencies to local governments, increased inter-municipal, metropolitan and regional coordination, and collaboration through international networks of local governments to exchange practices and advocate for the right to housing at global level.